Just in time for Zorra’s 2016 World Bread Day event, I received my copy of Stanley Ginsberg‘s The Rye Baker in the mail. I met Stanley several years ago at the The Fresh Loaf forum, when he looked for test bakers for his first book, “Inside the Jewish Bakery”. Though, at that stage, some recipes still were a bit rough around the edges (my husband complained about feeling like a guinea pig! 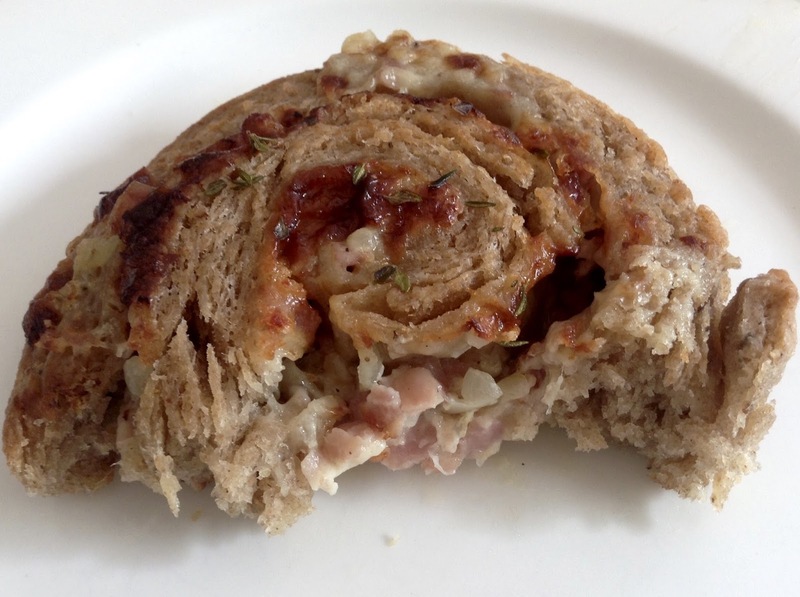 ), the book was well worth it, and his Onion Rolls are still a great favorite with my customers. Last year, I was happy to help with the translation of some German recipes Stanley considered for his newest book, devoted entirely to rye breads. Leafing through the The Rye Baker, a cluster of spiral shaped savory rolls caught my eye. 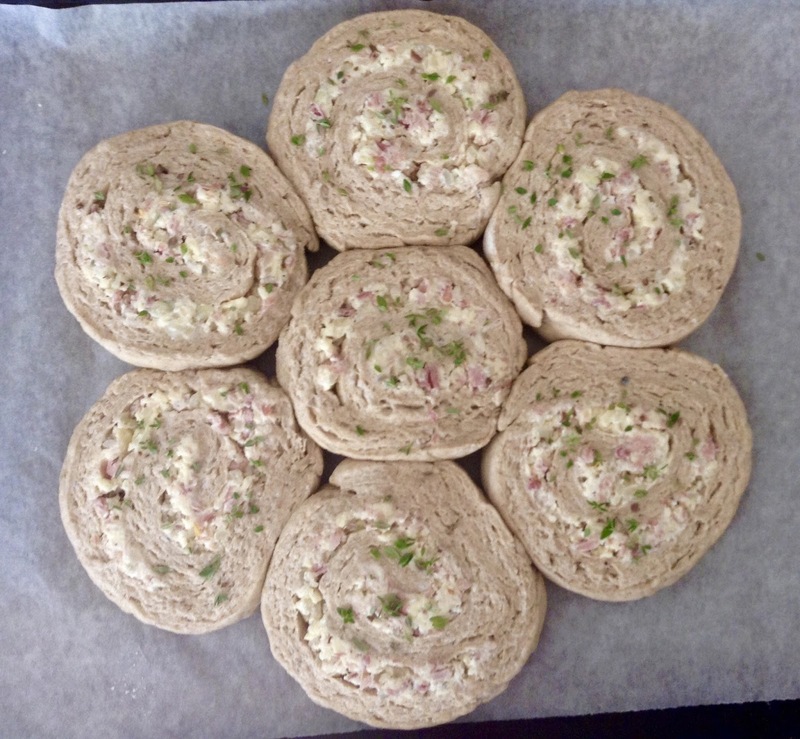 Not only because the “Swabian Rye Flower” looked so attractive – it was made with a laminated rye dough! I had never even heard that such a thing existed. 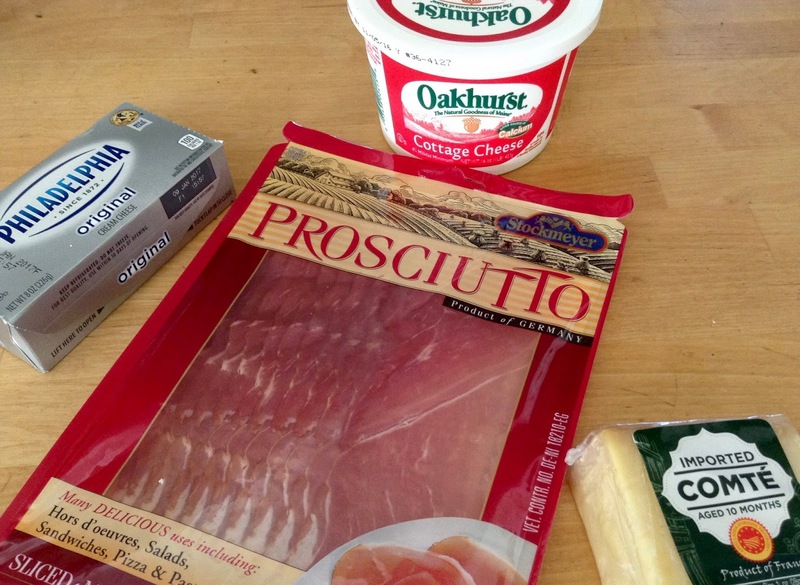 The filling was easy: Trader Joe’s Prosciutto (lightly smoked), and French Comté cheese were already in my fridge, and for the herb topping I snipped off fresh thyme in the garden. The cottage cheese for the filling had to be rinsed and drained to make it, mixed with cream cheese, dry enough to emulate quark (what they would have used in Germany). 10 grams of instant yeast seemed a lot, I reduced the amount to 9 grams (and would try 8 next time), and it rose just fine. Laminating the dough was a bit more challenging. The recipe requires vegetable shortening for the fat layer. I had made croissants before, and if butter and dough are sufficiently chilled, the fat stays put during the rolling and folding process. Soft shortening is more difficult to contain. I should have straightened the edges of the rolled dough with a knife before folding it. This step from croissant making could have prevented a raggedy seam where fat can be squeezed out. Too late: on this day neither my hands, nor the rolling pin or work bench needed any more lubrication – Crisco took care of it! Fortunately, most of the shortening behaved, staying within the dough, and the fat leakage during baking was not more than to be expected. 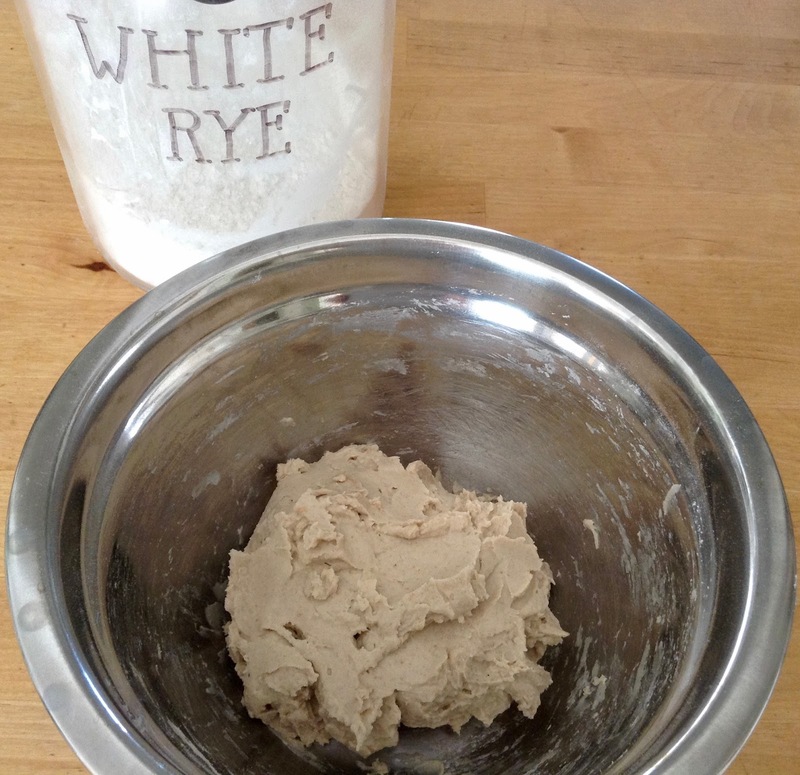 Stanley chose shortening because of the water content of butter – shortening doesn’t have any – that could make the sticky rye dough even stickier. His advice: if you want to laminate with butter, you should mix it with some flour (1 tbsp flour/200 g butter). We loved the hearty rolls! The laminated rye layers came apart and had a satisfying crunch, and the filling was delicious. The pretty flower shape, though, prevented the crisping in those places where the rolls touched. Being a sucker for crispiness, I would sacrifice form for function next time, and bake the spirals separate from each other. 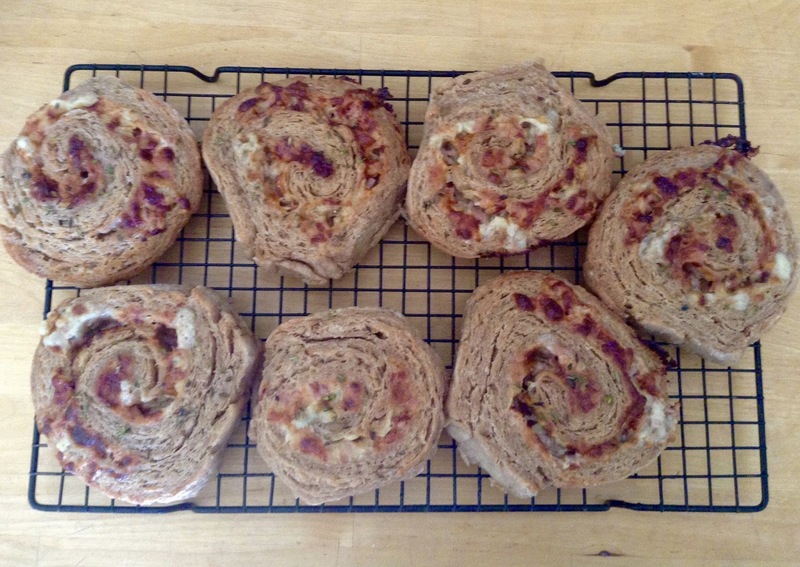 But I will definitely make the Swabian Rye Rolls again! One of these tasty rolls are a meal! 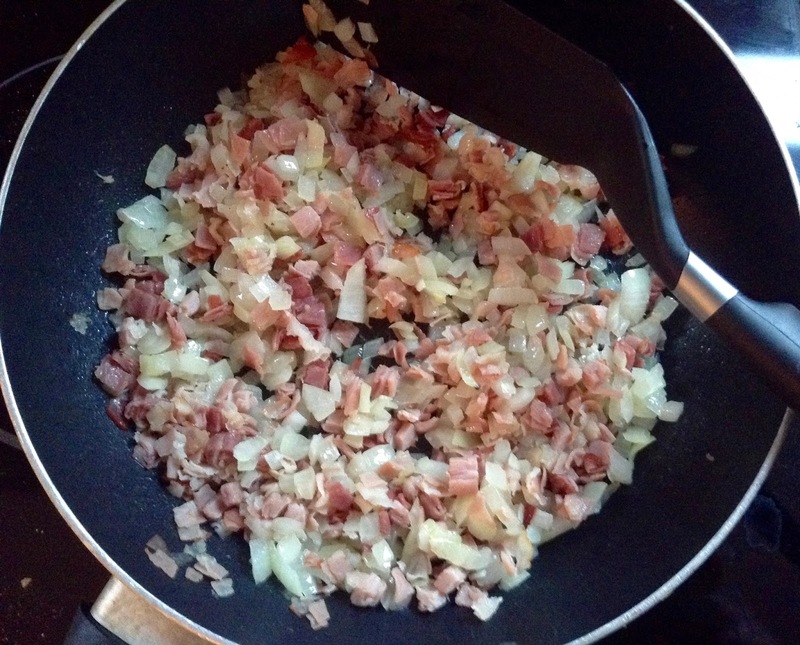 For the filling, in medium skillet over medium heat, sauté ham and onion in oil, until onions are translucent. Let cool to room temperature. In medium bowl, mix all three cheeses, until well blended. Stir in ham, onion, and season with pepper to taste. (I did not add extra salt). Cover, and refrigerate until needed. For the final dough, mix ingredients at low speed (KA 2, dough hook)), until dough pulls back from sides of bowl, 5-6 minutes. Wrap dough in plastic and refrigerate for 1 hour. 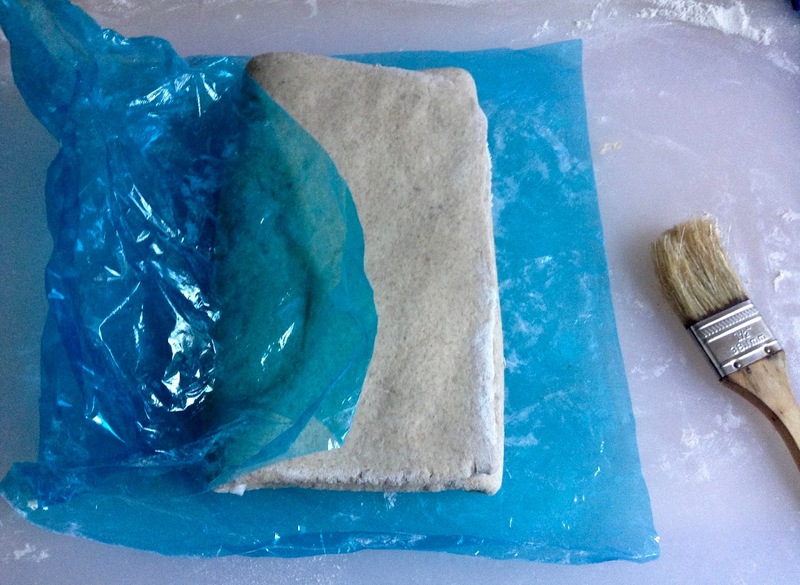 For laminating, transfer dough to lightly floured work surface, keeping extra flour and a pastry brush at hand. Always lightly re-flour work surface as needed, to prevent sticking, and brush off any excess flour from dough before folding! 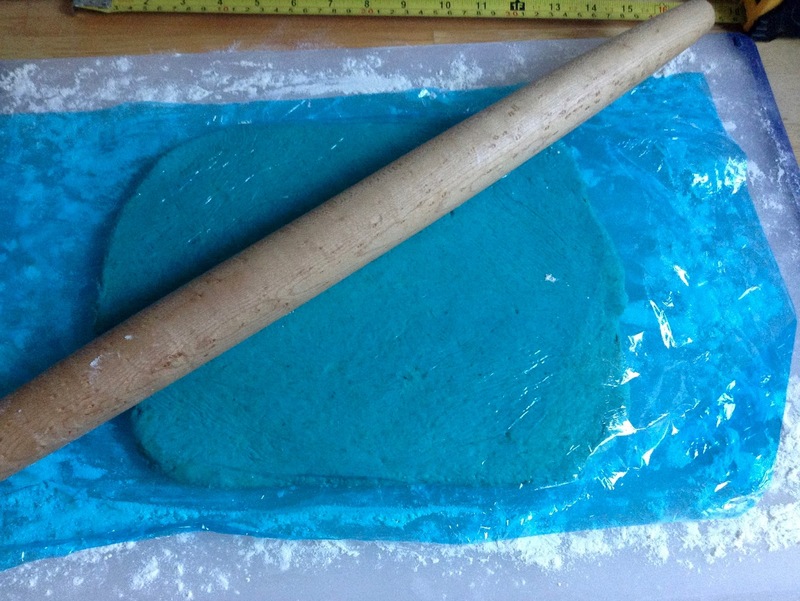 Roll out dough into a rectangle (45 x 20 x 1.25 cm/18 x 8 x 1/2 inches). Spread 1/2 of the shortening in an even layer over left 2/3 of dough (leave a 2 mm free rim along the sides, since the soft shortening spreads a bit when rolled). Turn dough 90 degrees, re-flour work bench as needed, and repeat rolling, greasing (with remaining shortening) and folding. Wrap dough in plastic, and refrigerate for 20-30 minutes. 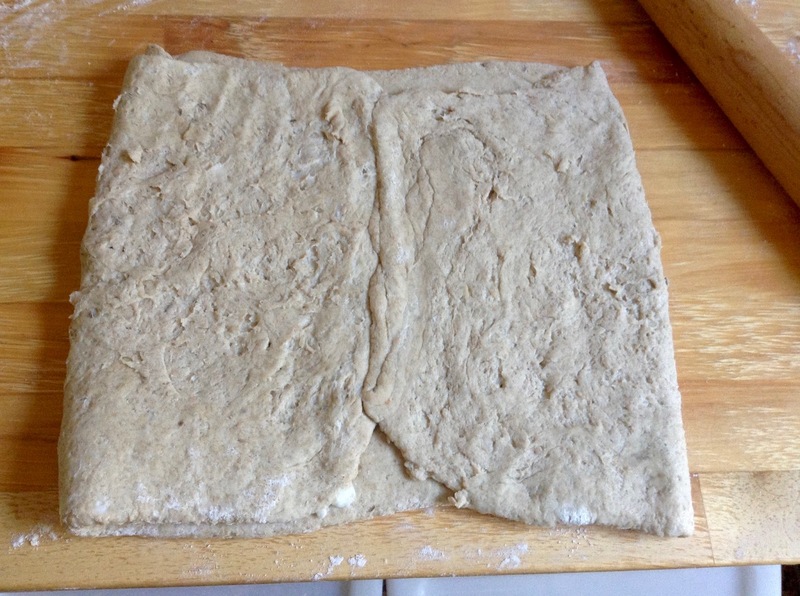 Roll out dough to the same size, and fold into thirds again. 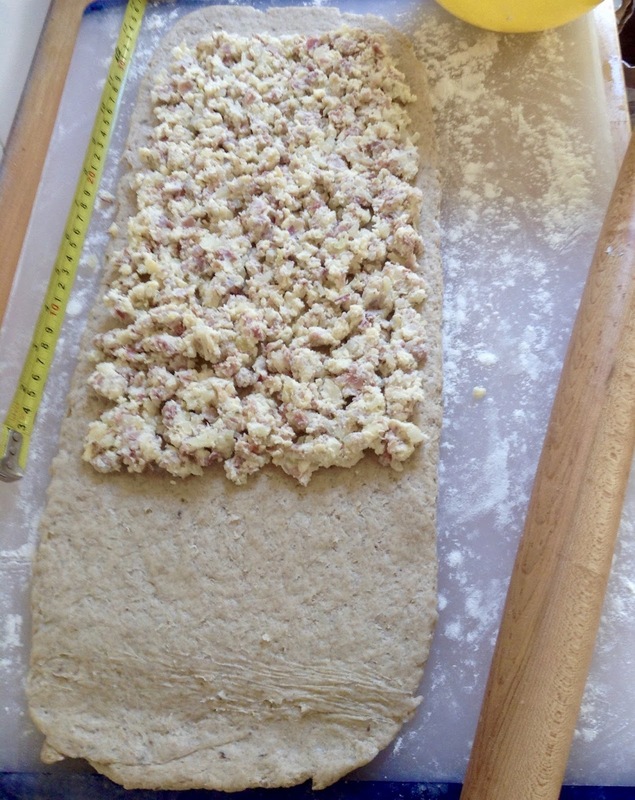 Roll out dough to a rectangle (60 x 20 cm/24 x 8 inches). With bench knife, straighten and square short edges as needed (to get an even seam). Fold rectangle into fourths, bringing left and right side towards center, the fold in half, like closing a book. Wrap in plastic and refrigerate for 20-30 minutes. 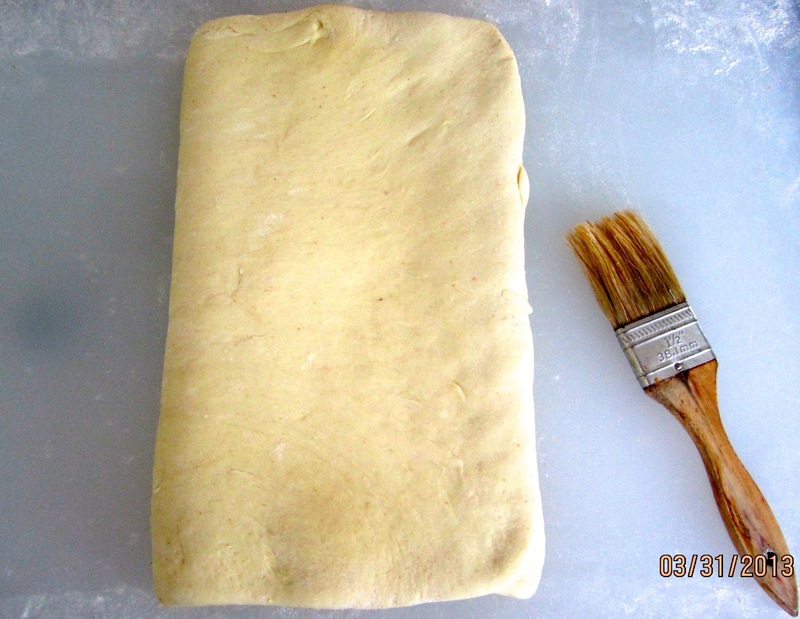 If I had remembered to straighten the edges, my folded dough package…..
…….could have looked like this (croissant dough) – no smearing of grease! 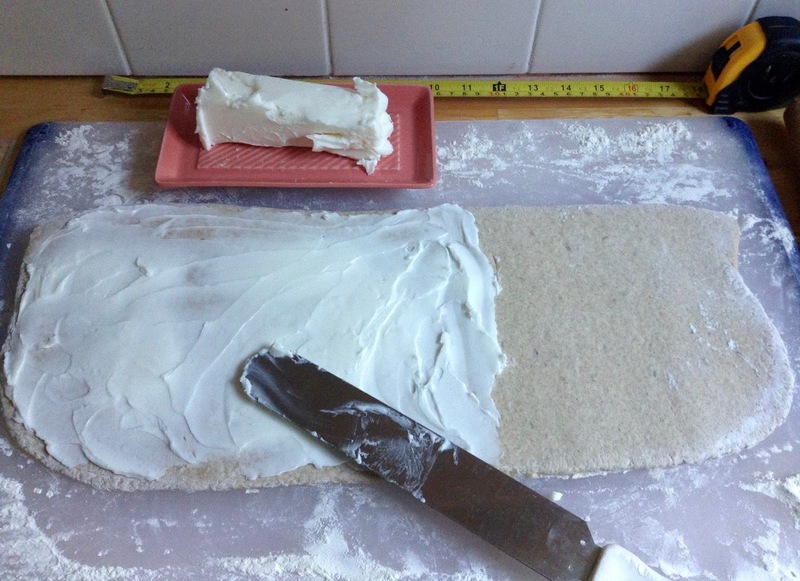 Roll dough out into a 20 x 45-50 cm/8 x 18-20 inches rectangle (1.25 cm/ 1/2 inch thick), short end facing you. With rolling pin, taper dough on near side (so that it’s easier to seal the seam later). Starting 2.5 cm/1 inch from far edge, spread filling evenly over ca. 4/5 of dough. 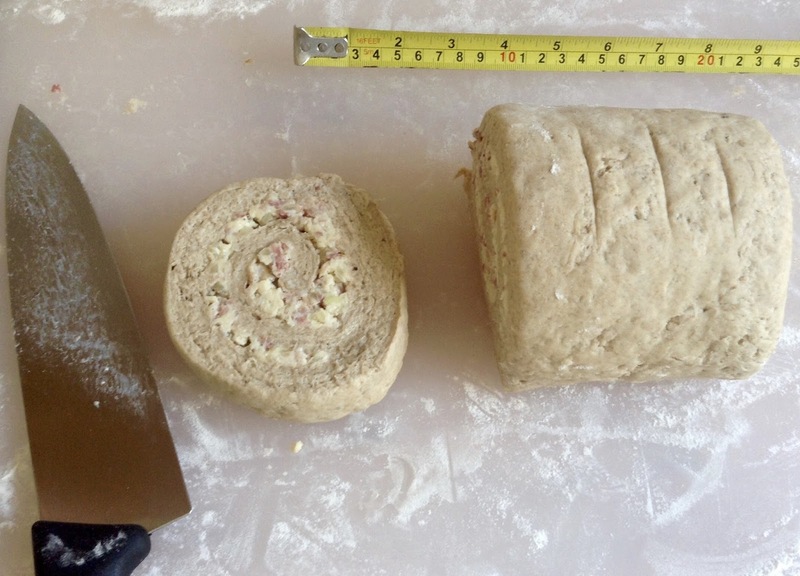 Roll dough towards you into a log, like a jelly roll. Moisten free bottom edge with water, and press to seal. Cover, and proof rolls at room temperature for 20-25 minutes. They will not have grown much in size, but the spaces between the rolls will have shrunk a bit. Place rolls in oven, creating steam by pouring a cup of boiling water into steam pan. After 5 minutes, remove steam pan, and continue baking for another 17-19 minutes (rotating baking sheet 180 degrees after half the baking time for even browning). Rolls should be medium brown, and the cheese melted and bubbling. We loved the hearty rolls! STORAGE: The rye rolls can be frozen, individually wrapped in plastic, then placed in a freezer bag. Thaw, then re-crisp for a few minutes at 400ºF. Or microwave frozen rolls, until halfways thawed (not fully!) then finish in the oven. Roggenblätterteig, unglaublich! Hier bei den Schwaben hab ich sowas noch nie gesehen, vielleicht wir es Zeit für einen Re-Import. Toll geworden! Ich habe 20 Jahre im Schwabenländle gelebt aber nie ein Roggenblümle gesehen. Sieht sehr sehr lecker aus. Danke, Anna. Ich hätte auch nicht gedacht, dass sowas mit Roggenteig geht. Vielleicht probier ich mal Croissant nach diesem Rezept. Ich glaube, das deutsche Originalrezept stammt von einem Bäckerwettbewerb für Roggenbrote – es ist einfach ein Fantasiename. Danke, Carola! 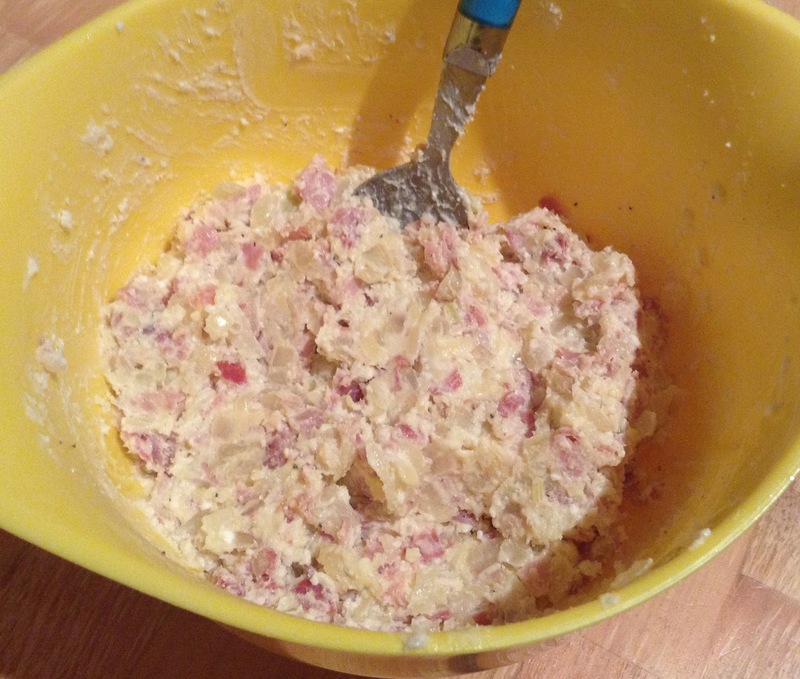 Ich habe mal gegoogelt, weil mich interessierte, ob es so ein Rezept in Schwaben tatsächlich gibt (was ich mir angesichts des aussergewöhnlichen Teigs nicht vorstellen konnte). Ich denke, es ist ein Fantasiename für einen preisgekrönten Beitrag in einem Wettbewerb für Roggenbrote (Grand Prix für Roggenbäcker). Diese Brötchen sind so lecker, dass ich sie sicher noch mal backen werde. Mir ist vor kurzem ein Bild eines laminierten Roggenteilchen einer Pariser Bäckerei begegnet, das hatte eine magische Anziehung auf mich. Bisher hab ich es nur in einer rough puff pie pastry probiert und fand es grandios! Dieses Rezept kommt auf meine Liste, danke dafür! Ich freue mich, dass dir das Rezept gefällt, Susanna! 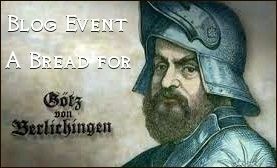 ich bin gerade dabei, es auf deutsch zu schreiben, mit deutschen Zutaten. Bitte, lass mich wissen, wie das Ergebnis ist, wenn du die Roggenbrötchen probierst. Interessant von Roggenblätterteig habe ich auch noch nie was gehört. Und jetzt habe ich Hunger! 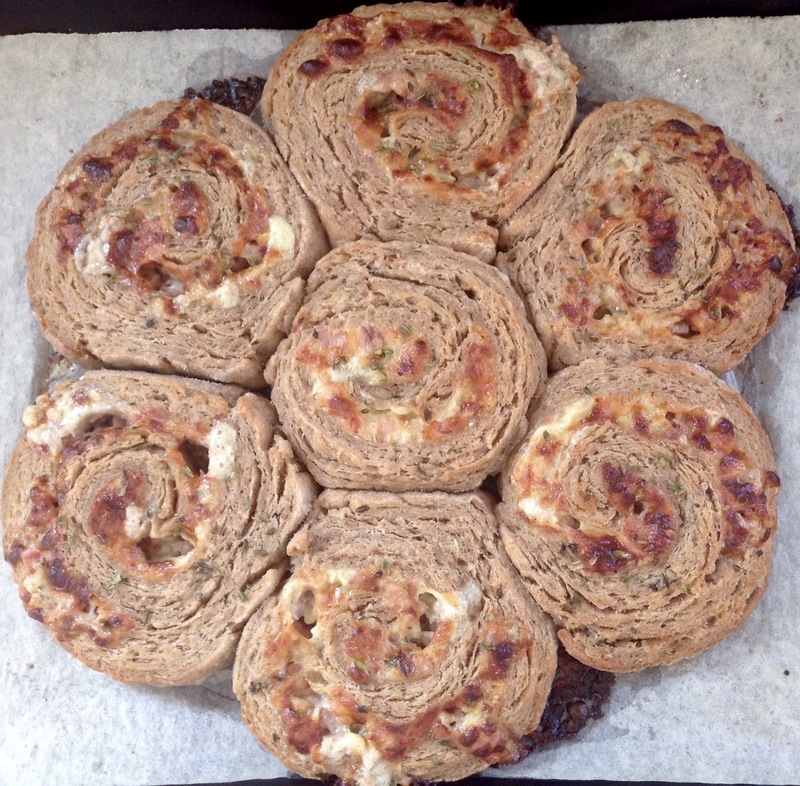 Danke fürs Mitbacken beim World Bread Day 2016! Danke fürs – zweifellos sehr arbeitsintensive – Ausrichten, Zorra. Dang……I just discovered The Rye Baker at the book store and will get it but then I realized I had not gotten a post from you in forever! Glad to see this one and glad you (and Ruffi) are OK. I have been baking the Classic Rye and seeded Rye Loaves from Trine Hahneman's book. What a trip they are! And I have a Raadvak to slice them with. Happy Days. Susan, for some reason this comment only showed up today in my feed. – Yes, I was really slow in posting anything last year. I hope this year will be better, I have a long list, but had so many other projects to do. I bought Trine Hahnemann's book, too, but haven't tried anything from it, yet.